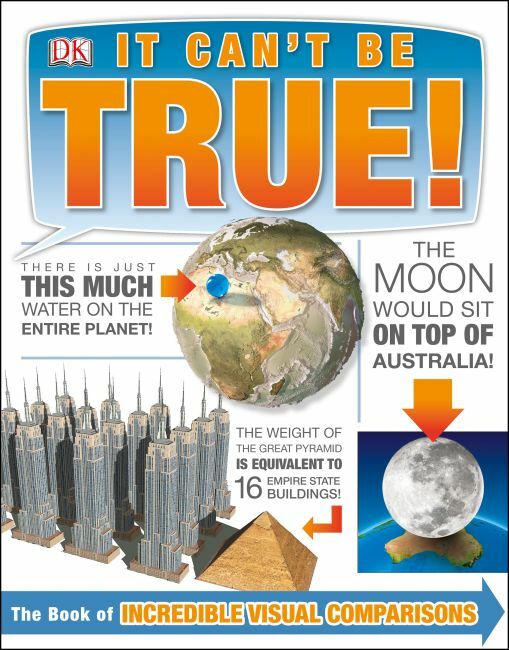 "DK's latest brain-boggling book, "It Can't Be True", with more than 200 jaw-dropping visual comparisons on subjects from animals to human-body feats of engineering and outer space, is aimed at capturing young readers' attention with impossible-to-believe facts and figures. es. The book, developed with the Smithsonian Institution, provides detailed information for each of its many illustrations. While the publisher recommends the book for ages 8 to 15, I think younger children and adults will also find the book full of fascinating illustrations and facts and I recommend it for age 6 to adults." "DK has once again created a visually stunning book filled with interesting facts for browser. Recommended." About It Can't Be True! The moon is the same size as Australia. A blue whale's heart is as large as a car. It sounds weird, but it's true! It Can't Be True! wows the reader with impressive facts about the world that are all difficult to believe, but true. From animals and the human body to buildings and outer space, this quirky book combines the latest CGI and photographic imagery with impossible-to-believe, accurate facts about just about everything. Children will enjoy these fun facts and impressive figures, and incredulous adults will be flabbergasted by these crazy factoids. It Can't Be True! will engage any reader with its head-scratching, amazing facts.